Help a needy family in our community have a nicer Holiday Season. The Battleship has joined forces with the US Marine Corps Reserve by participating in their annual Toys for Tots program, now through Dec. 19. Bring in a new toy or game for an area family and you’ll get a 20% discount on a Fire Power Tour of the World’s Greatest Battleship! 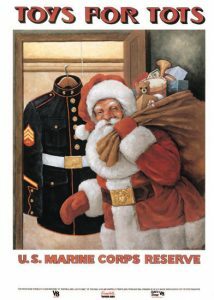 Toys and games can be dropped off in the Toys for Tots Box in the Battleship’s Visitors Center. Thanks and have a Happy Holiday Season!